The Entertainment Media Show is a convention held at Kensington Olympia every autumn. It gives you the opportunity to meet your favourite film and television stars, as well as comic book artists and your favourite sports heroes. 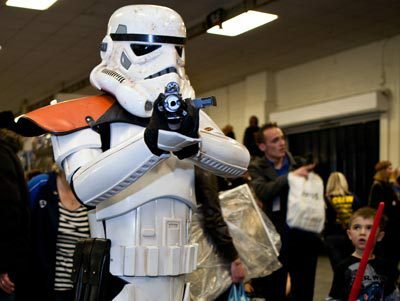 Not only can you meet the stars, but they will write you get the stars' autograph, but you can also have your picture taken with them by a professional photographer, and ask them those burning questions at a selection of free and paid for talks. There's plenty more to do besides meeting the stars. EMS has a gaming area where you can play classic games on retro consoles including the PS1, Nintendo 64, and SNES. It also the chance to play new games on consoles you may not own yourself. Sometimes the organizers even hold Mario Kart competitions; racing your way to victory will win you an autograph voucher. This year, there DS: London will be attending, so if you bring your DS, you can enter gaming tournaments. Manga fans are in for a treat with the Comic Alley, where artists will draw you a cartoon for you on the spot. You can even get a caricature of yourself done. If you fancy testing your own drawing skills, there is an artist area providing all the tools you need to make your own manga characters, or you can go one step further and dress up for lots of Cosplay fun (Don't worry, there's a changing room if you don't want to get weird looks on the train). Tickets can be bought here or on the day. Standard entry is £6, but you can get in early for £12. There are also gold passes available for those who want to beat the queues and get a goodie bag. I went to the Entertainment Media Show last year and had a great day. I met Armin Shimmerman, who was very friendly, and told me about how when he played a Nox on Stargate it was raining so much that his flaura headpiece started to smell of damp straw. I was also looking forward to seeing Jennifer Lien from Star Trek: Voyager because she has only very recently started doing convention events. I heard that this is because she is very shy, and this really showed. She hardly spoke at all, and seemed a bit spaced out and overwhelmed. I felt kind of sorry for her, but was also very grateful that she agreed to come. Joe Flannigan from Stargate: Atlantis gave a very amusing talk, recalling a prank he once played on set that backfired; it had everyone in stitches. I had a great haul on the merchandise front. I was at one stall, which had a number of Star Trek figures, including one of Janeway (which are practically impossible to find). There was a Harry Potter stand selling promo products and props, which was really cool. They had Harry/Ron/Hermione/Voldemort's on screen wands on display, Luna's converses, and bits of the Quibbler. I asked if they had any Slytherin stuff, but they didn't - well they had one, but it was waaaaaaaaaaaaaay out of my price range (£950). It was a Slytherin student cloak that was worn on screen. It was wicked. They then went on to show me Death Eater stuff - I find it rather irritating that if you ask for something Slytherin, they automatically put Death Eater into the equation. While I could not afford anything at the promo stall, I did bow to temptation when it came to some Harry Potter wands. I have been interested in having one for a while, but was always in two minds. I didn't really want one of the trio's wands, but when I saw Snape's wand for sale, I had to have it. There was a display case at the convention with various Star Trek Props. These included two of Kes's outfits and Data's head! I had a mega 'squee' moment when I saw that. My only real disappointment was my lack of funds; these conventions can get quite expensive if you want to meet a lot of guests. Autographs range from £10-£40 depending on the guests, and photo shoots are usually £20. When it comes to the dealer stalls, I would recommends shopping around first because the prices at each stall can vary quite a lot.